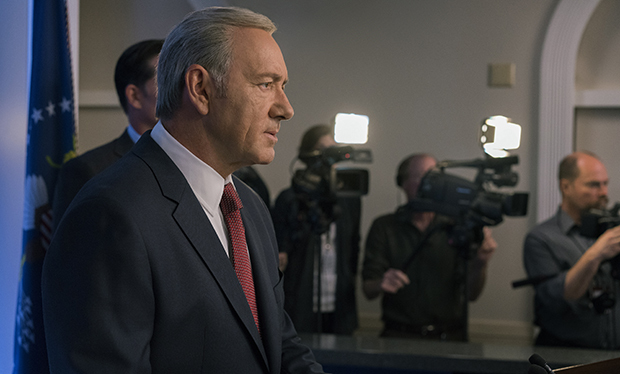 PLOT SUMMARY: Series 5 opens with President Frank Underwood (Kevin Spacey) fighting an election against Will Conroy (Joel Kinnaman). He's also fighting to avoid congressional inquiries and to battle the accusations regarding the Zoe Barnes murder in an article written by Tom Hammerschmidt (Boris McGiver). He has however successfully suppressed the publication of Thomas Yates (Paul Sparks) tell all book by having Claire sleep with him. At the end of last season a terrorist called Josh Masterson (Jefferson White) beheaded a man called Miller before going on the run. At the start of this season, Miller's daughter publicly blames the President for his death at the funeral. She also hopes Frank dies and this wife, Vice Presidential candidate and current First Lady Claire Underwood (Robin Wright) will become President instead. In response to the terrorist attack, Frank declared war on terrorism, whips up a climate of hate, fear and eavesdropping on family and colleagues, and has severely restricted immigration. Secretary of State Catherine Durant (Jayne Atkinson) speaks to the chaos this is causing. Conroy decides not to oppose the declaration of war but wants to focus on the article's accusations against Frank. However he is aghast when his wife Hannah (Dominique McElligot) expresses public sympathy with the terrorist and asks for understanding. In response, Claire Underwood speaks to the terrorist's mother, tries to make her take the blame and to show her the video of the beheading. In response Mrs Mastersen publicly asks her son to turn himself in. Meanwhile Claire's campaign manager Leann Harvey (Neve Campbell) needs Aidan McAllan (Damian Young) to break into the NSA and erase the traces of his previous work designed to track which words and ideas voters responded to by illegally tracking their social media and phone conversations. In the final scene, Frank breaks the fourth wall and reveals that he had Joshua Masterson in custody the entire time. COMMENTS: This is the first season of HOC without the original creator, Beau Willamon, as show runner. It's too early to tell how his replacements, playwrights Melissa James Gibson and Frank Pugliese will change the tone but so far it's very similar. The only difference I detected was perhaps even darker cinematography for Frank and Claire from DP David M Dunlap - perhaps reflecting their descent into chaos and fear to distract from their political troubles. Of course, this series will suffer from real life overtaking fiction. I found the scene between Cathy and Frank rather too on the nose in criticising Trump's immigration policy. However, it's hard to know how far the show can avoid the overlaps given it's set up of terrorism as a major theme last season.